A few short weeks ago, 14-year-old Randy Forsythe was happy living in Ontario and hanging out with his friends at Eaton Academy, a prestigious school for gifted students. That was before his father lost his job and had to move the family, which now includes Randy's less-than-brilliant new stepmother, to Nova Scotia. If living without the Internet in a dilapidated house on the Bay of Fundy wasn't bad enough already, Randy gets fingered as an easy mark by Jake and his gang of bullies because Randy has access to something they want. And they know how to make him get it. QUESTION: Where did the idea for Stranger at Bay come from? DON: Stranger at Bay grew out of two images from my teaching experience that haunted me long after the moments had passed. The first was of a boy who had been bullied by another, much larger student. Although I had witnessed the bullying—had, in fact, intervened and stopped it—the smaller boy hurriedly explained that I had misunderstood their actions. As he tried fervently to convince me with words that they were “just fooling around,” I could see in his eyes that the opposite was true. But his eyes also told me that whatever I had interrupted was, for him, far more preferable than the reprisal he feared if the other student was punished. I never forgot the look in that boy’s eyes. When I created the character of Bobby Hancock, I imagined his eyes having that same look much of the time. QUESTION: So you decided to write a story about bullying? DON: Yes and no. Knowing what I’d like to write about is never enough for me to begin a story. I can try, but I never get very far. It’s only when I know who my story is going to be about that the “what” unfolds in my head. Yes, I wanted to write a story about bullying, but it wasn’t until much later that I could. I said there were two images that haunted me. The second appeared one June during my school’s closing ceremony when students in grades 7-11 gathered in the gymnasium to receive awards for outstanding achievement. Because I usually presented one or more of the awards, I was sitting with the other presenters on the stage, and from this position I could see the expressions of the winners when their names were called, as well as watch them approach the stage to collect their prizes. I’ve always been interested in the different ways students accept them. Usually, when students were called up to the stage to accept athletic awards, everything about them—their faces, the way they walk, the way they hold their prizes—showed how thrilled they are. That June, though, as the academic awards were presented, a student approached the stage with a look of utter embarrassment on his face, almost as if he were ashamed of having done well. His reaction bothered me because, as a teacher, I wanted students to be proud of their academic achievement. On that particular day, I began wondering why a person might react that way to winning such an award, and this, in turn, made me want to explore how it might feel to be a gifted student. 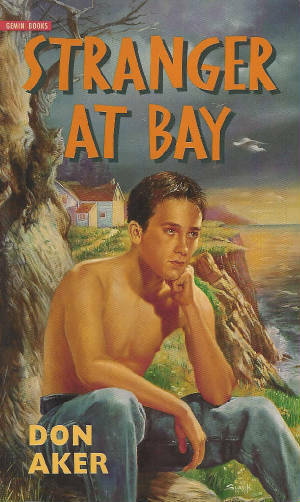 That gifted student became Randy Forsythe, the main character in Stranger at Bay, who eventually recalls in Chapter 19 his own embarrassment at accepting an academic award at a previous school. QUESTION: How do you begin a book? DON: Having written both fiction and nonfiction, I’ve discovered I have different processes for writing each. When writing the latter, I first have to identify what I know about my subject, and then I begin drafting ideas and information as quickly as possible, generating pages and pages of raw material. In the process of doing this, I discover what I don’t know about my subject, and I make a list of those things that I need to research. Once I’ve finished collecting (and researching) all this raw material, I have to circle around and around it, trying to find an order in which to present it, and this order then dictates the shape of the book that will follow. (And, of course, I revise and revise and revise...) As I said earlier, the process I follow when writing fiction always begins with a character. I visualize a person and get to know him/her on the page as though I were meeting a real human being, learning about his/her family/interests/talents/fears/foibles/etc. Sometimes I like this person and sometimes I don’t but, as time passes, I begin to understand what drives this person and, more important, I discover what’s keeping this person from being everything he/she wants to be. Once I know this, I know what my story will be about. QUESTION: So you figure out everything about your characters before you begin writing a story? DON: Not everything. Some writers may do this, but there are things I don’t know about my characters when I begin a story because I don’t need to know these things yet. For example, before I began writing Stranger at Bay, I knew that Randy disliked his stepmother, Norma, and I assumed that he resented her for marrying his father. However, the more I wrote, the more I found it didn’t make sense that he was only jealous of her. Also, as I got farther into the novel, I began to like Norma a lot, and I found myself wanting Randy to like her, too—but I didn’t see how this could happen if he couldn’t overcome his jealousy of her. As I kept circling around this problem, I eventually “discovered” that the problem was more than simple jealousy on his part. Randy’s past relationship with his own mother made him distrust Norma and lash out at her every chance he got. For me, the process of discovering things about my characters is what sustains me throughout the writing, keeps me going from the first page to the last. I can’t “make” my characters do things. I sometimes try, but they quickly let me know what they will do and what they won’t do. I always get into trouble when I don’t listen to them. QUESTION: You lived for many years in a small town in the Annapolis Valley, and Brookdale is a small town in the Annapolis Valley. Is Middleton the real-life Brookdale? DON: I used to tell my language arts students that the one thing that separates strong writing from weak writing is the amount of information the writer has about his or her subject. It’s no secret that writers write best when they write about what they know so, yes, I used Middleton as a model for Brookdale. Despite their similarities, though, one is real and the other is fictional. QUESTION: So Brookdale High doesn’t really exist? DON: No, but Middleton students see lots of similarities between that school and Middleton Regional High. For example, MRHS went through major renovations in the early 1990s just like Brookdale High. And just like in Brookdale High, Middleton students couldn’t get to their music room, which was on the lower floor, without first going upstairs. Not all of the renovations made sense, which is something Randy observes in the novel. QUESTION: Speaking of places, Randy really hates the Bay of Fundy, and he says so many times during the novel. Do you feel the same way? QUESTION: The tone of Stranger at Bay is a lot lighter than your first novel, Of Things Not Seen. Did you intend this? DON: Definitely. Of Things Not Seen was hard for me to write because its subject matter—domestic violence—is so grim. I spent a lot of time immersed in that subject learning some very disturbing things, and when the book was finally finished, I knew I needed to try something lighter. Of course, there are some grim moments in Stranger at Bay, too—bullying, vandalism, and parental desertion aren’t laughing matters—but Randy appeared in my head with a sense of humour firmly in place, and I tried hard to capture that on the page. QUESTION: Were you thinking of any of your students when you were writing Randy? DON: Quite a few, actually. Every year, I taught students who were wickedly funny. I’ve lost count of the times I said, “__________ should have his (or her) own show.” I hope people like that are able to hold on to their senses of humour. Laughter really is the best medicine, and we all benefit from being around people who make us laugh, especially at ourselves. QUESTION: You wrote Stranger at Bay in the first-person point of view, but most of your other novels are written in the third person. Why don’t you use first person more often? DON: First person is the most intimate of all the points of view because the main character speaks directly to the reader. Given the chance to hear about an event from a news reporter or from someone who was actually on the scene when it happened, most people would choose the latter—hearing about an event from someone who has actually experienced it heightens its impact. This is the real power of first person. However, it’s also one of the most limiting points of view because the character telling the story can only share with the reader things that he or she actually knows. This becomes problematic when the writer wants to share information about something that this character doesn’t know. For example, in order for me to tell the reader what was going on with Randy’s friends in Ontario, I had to manufacture ways for Randy to get this information like reading an email or talking to his friends on the phone. (You may have noticed that there are quite a few phone calls in this book.) This may not sound like much of a problem, but while I was writing the novel, there were many times when I wanted to give the reader information that I couldn’t because there was no way Randy would know it. So, although the first-person point of view is powerful, it can also be problematic, which is why I’ve chosen third person for most of my novels. However, I returned to the first person in my fifth novel, The Space Between, because I couldn't write it any other way. And I enjoyed the challenge. QUESTION: What's the novel about that you're working on now? DON: I can’t say—and this has nothing to do with my worrying that someone may steal the story. (As a matter of fact, I’ve learned that there are really only six stories anyway—every novel is just a variation of one of these.) The reason I don’t talk about a novel before it’s finished is that talking seems to dissipate the energy I need to write it. I lose the need to put it on paper. However, if I don’t talk about it, I have to write it. QUESTION: So one piece of advice you’d give beginning writers is not to talk about their writing? DON: No. Some writers benefit from talking through a story before writing it, which is why writing groups are so helpful. Every writer needs to discover what works best for him or her. For example, some people need to write during a certain time of day, some people need to use a particular pen or computer program, and so on. I’ve found that each time I end a writing session, I need to stop in the middle of a sentence. That way, when I return to it, I have to finish that sentence, which kick-starts my brain into writing. I’m sure not all writers have to do that, though. QUESTION: What time of day do you write best? DON: I began writing when my daughters were very young, and I never wanted them to think they were less important than a story I might be working on. Children are children for a very short time, and I wanted to be available to play hide-and-seek with them and build Lego towers and take them for walks and read stories and listen to them tell me theirs and all the other things that dads do. When I was a teacher, I always had schoolwork facing me later in the evening, and after that I was just too tired to write. Therefore, at the beginning of my writing career, I set my morning alarm for five o’clock and wrote for an hour or so before I had to get ready for school. It was very hard at first, but by the end of the first week my brain was beginning to realize what I needed it to do, and I followed this schedule for years. Once my daughters were older and involved in various activities of their own, I began writing whenever I could grab a moment, and now that my daughters have grown and I’ve retired from teaching, I begin writing after breakfast and continue until my wife gets home from work. DON: I just don't have time for it. When I had a full-time job, I had to make the best use of whatever moments I could steal for writing, so I guess I’ve trained myself to keep plodding through a manuscript. This doesn't mean that everything I write is wonderful—in fact, I write a lot of garbage that I never use—but writer’s block was a luxury I simply couldn’t afford in the beginning, and that influenced how I continue to approach writing now. If I find something isn’t working for me, I try writing it another way. If that doesn’t go anywhere, I work on something else. I’m sure I don’t speak for all writers when I say this, but I believe writer’s block is more an avoidance strategy than an insurmountable writing problem. After all, writing can be hard work much of the time. Who wouldn’t want to avoid it from time to time? QUESTION: Do you write longhand or on a computer? DON: I’ve actually lost the ability to write by hand. I can type much faster than I can write with a pen or pencil, so writing on the computer allows me to chase thoughts more easily. Because I’ve been writing on computers for over 20 years, my writing process has completely changed. Before then, I had to have a much clearer sense of where I was going, but computers allow me the freedom to throw all kinds of ideas on the screen and see what works and what doesn’t. Also, computers make the revision process infinitely easier. I’d be a lot less likely to change something if I had to rewrite everything again by hand. QUESTION: All of your other novels start with Chapter 1. Why did you begin Stranger at Bay with a prologue? DON: I said earlier that the first-person point of view is limiting, and this is an excellent example of that. For most of the novel, Randy can’t remember the nightmare that has terrified him since he was a child, but I wanted my readers to know exactly what that dream was like at the beginning of the story. However, since the novel is told in the first person, I couldn’t have Randy describe it because his mind has repressed it. I needed some way to describe the nightmare using third person, and I felt I could do this in a prologue because a prologue isn’t part of the narrative thread. The prologue ended up being one of the last things I wrote, and I liked the way it gives readers information that Randy himself isn’t aware of until much later. Another reason for writing the prologue is that I wanted to prepare readers for the fact that there is something seriously wrong in Randy’s world—and not just his dissatisfaction at having to leave his home in Ontario. Because the tone of the first chapter of Stranger at Bay is considerably lighter than Of Things Not Seen, which I'd written earlier, I didn’t want to “trick” readers into thinking this story was humorous fiction and then shock them later with the news that Randy’s mother abandoned him in a mall when he was very young, an event that scarred him emotionally and psychologically. By itself, Chapter 1 would fail to communicate this darker side of the story. Ironically, I’ve since discovered that many young adult readers ignore prologues. As a result, a number of them skip over mine, which is too bad. I like its weirdness and the way it introduces something that takes a while to pay off. QUESTION: What’s your favourite part of the novel? DON: I guess it would have to be the scene in Chapter 18 when Randy finally remembers being abandoned by his mother in the mall. Often, I’ll rewrite a scene—especially a pivotal one—many times until I’m satisfied with it. That repressed-memory scene unfolded in my head almost exactly as it appears in the novel. QUESTION: Randy makes a lot of decisions in Stranger at Bay, some good, some bad. Is decision-making an important theme in the novel? DON: Everyone has to make decisions. Sometimes we may try to avoid them, but not making a decision is actually making one. (A friend once told me this and, at first, I had a hard time seeing how it could be true. But she was right. When you don’t make a decision, you already have.) During my teaching career, I had the misfortune to watch some students make unwise decisions and then live with the unfortunate consequences. Too often, young people who make mistakes believe there’s no turning back. In writing Stranger at Bay, I wanted my readers to realize it’s never too late to do the right thing. An American Library Association "Quick Pick for Reluctant Readers"